Soft, supple leather half chaps allow for comfortable flexion at the ankle. Full length elastic leg inserts give a close, superior fit. 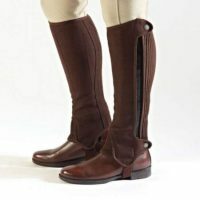 Full length zips with press stud security fastenings, elastic foot stirrups, stretch front ankle inserts and reinforced inner legs to withstand wear.